For the adventure tourist, the spectacular geography, the rural cultural experience and the historic legacies of the Wakhan provide an ideal blend for a ‘gold star’ destination. The Wakhan is an essential component for every visitor to the Pamirs and should not be missed! Panj river which, in the western parts, meanders across a broad and flat valley floor. In the upper reaches of the Wakhan the geography and environment changes dramatically. The valley sides close in on both sides of the river and, as a consequence, the track hugs the cliffs and precipaces. The flora changes from alpine valley to high desert plateau as the Eastern Pamirs approaches. A political creation of the ‘Great Game’, the Wakhan was devised to geographically separate the British and Russian empires in the 19th Century and it now stands out as one of the more obscure international boundaries. 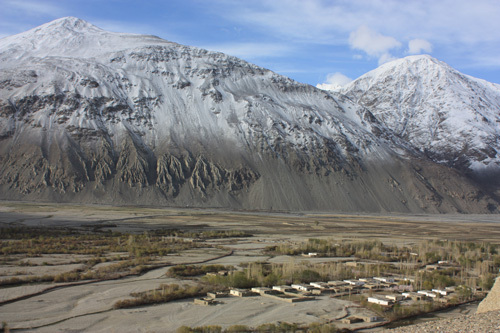 The political unconformity, the mix of travellers that have passed through and the physical harshness of the environment – winters usually see thick snows and temperatures of minus 15C and below – have meant that a distinct culture and language of the peoples of the Wakhan has developed. In the lower altitudes are the Wakhis, a community that relies on subsistence agriculture, growing mainly potatoes and wheat. 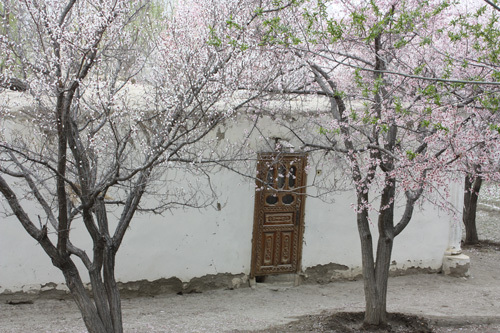 They speak varieties of the Wakhi language (where village dialects are often indecipherable from each other), derived from several Iranian languages, and are Ismaili Shia, followers of the Aga Khan. In the higher altitudes are the pastoral Kyrgyz, who are generally Sunni and who speak Kyrgyz, of Turkic origin. Not having two vegetables to fry together has done nothing to reduce the famed hospitality of these peoples! The valley forms an obvious trading route and it is believed that both Alexander the Great and Marco Polo came this way. The Portuguese Jesuit priest Bento de Goes crossed from the Wakhan to China between 1602 and 1606 and in 1906, Sir Aurel Stein reported that over 100 pony loads of goods were travelling up the Wakhan annually into China. To this day, camel trains can still be seen traversing the route and the remains of fortifications and caravanserai appear on most promontaries. 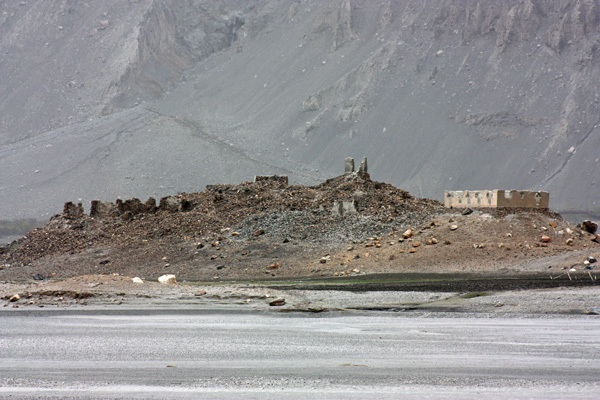 Probably the most spectacular site in the Wakhan is the fortress ‘Zamr-i atish parast’ (Fortress of the fire worshippers) which has its origins from the 6thC AD. Nearby is Bibi Fatima spring, a well developed sanitorium built around a cave where hot water gushes from some beautifully formed stalactites. This is an essential stop off to wash away the travails of the road – there aren’t many opportunities for hot showers in the Wakhan! Nobody really knows when and by whom Yamchun Fortress was built because legends in the Wakhan Valley are closely intertwined with reality, and it is sometimes almost impossible to separate them from true life. The most popular story tells about three brothers from the clan of fire-worshippers, the Siyakhpushes (which can be translated as ‘black caps’): Kaahka, the most well-known brother after whom the fortress next to kishlak Namatguti-Poyon had been named; Zengibar, who possessed the fortress Khisor situated not far from the kishlak Zong; and, finally, Zulkhasham who was the owner of Yamchun. They say that the three legendary brothers, using the force of the garrisons of their fortresses, showed long and stubborn resistance to the Arabian invaders headed by prophet Ali himself. The Siyakhpushes eventually succomed to the repeated attacks and, in their desire to retain their countless treasures, resorted to hiding them far north in a cliff-top cave in the area of Rangkul (see ‘legends of the far east’). Tales about Ali prove the legendary basis of the local history, for there is no historical data saying that prophet Mohammed’s son-in-law or any one of the Shiite imams reached the Wakhan in his campaigns.However, the Wakhan was indeed conquered by the Arabs and included into Arab Caliphate in the 8-9th centuries.